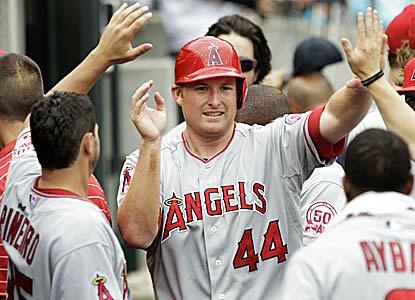 Mark Trumbo (2006-07) fell a single short of hitting for the cycle as he went 3-5 at the plate with a double, a triple, a HR, drove in five runs and scored three runs as the Angels beat the Tigers 12-7. Alberto Callaspo (2003) was 3-4 with a double, a walk, stole a base and scored a run. Erick Aybar (2003) went 3-4 with a walk, two RBI, stole a base and scored a run, Howard Kendrick (2004) was 2-5 with two RBI and scored three runs, Peter Bourjos (2007) went 2-5 with a RBI and scored a pair of runs and Jeff Mathis (2002) went 2-4 with a RBI in the win. Bobby Cassevah (2007) earned his first win of the season with 2 1/3 scoreless innings. Jordan Walden (2008) worked a scoreless ninth inning in the win. Sean Rodriguez (2004-05) went 1-3 with a RBI a walk and scored two runs in the Rays 10-8 win over the Athletics. Casey Kotchman (2002) was 1-4 with a run scored in the win. Joel Peralta (2001-02) allowed one run in one inning of work in the game. David Herndon (2007) worked a scoreless ninth in the Phillies 4-1 loss to the Giants. Ervin Santana (2002) struck out ten batters en route to his first career no-hitter to lead the Angels to a 3-1 win over the Indians this afternoon. Santana is the fourth player in Cedar Rapids professional baseball history to pitch a major league no-hitter joining Allie Reynolds (1940-41) (two no-hitters), Bob Forsch (1970-71) (two no-hitters) and Jerry Reuss (1967). Peter Bourjos (2007) went 2-4 with his seventh triple of the season, a RBI, stole a base and scored a run in the win. Howard Kendrick (2004) was 1-3, scored a run, walked and stole a pair of bases. Mike Trout (2009-10) went 0-3 with a sac fly, while Erick Aybar (2003), Mark Trumbo (2006-07) and Bobby Wilson (2004) each were 0-4 in the game. John Lackey (2000) won his fourth straight start as the Red Sox defeated Kansas City 12-5. Lackey struck out three in 5 2/3 innings of work while allowing three earned runs on eleven hits and one walk to improve to 9-8 on the season. Alexi Casilla (2004-05) went 2-4 with double a walk and scored a run in the Twins 7-2 win over the Rangers. Mike Napoli (2001-02) hit his 14th double of the season for the Rangers in the loss finishing 1-4 with a run scored. Casey Kotchman (2002) was 0-2 in the Ray 13-4 loss to the Athletics. Sean Rodriguez (2004-05) went 0-3 with a walk in the game. Brandon Wood (2004) was 0-3 with a walk in the Pirates 2-1 extra inning loss to the Braves. Fernando Rodriguez (2005) improved to 2-0 earning the win with two scoreless innings in the Astros 4-2 victory over the Cardinals. Rodriguez struck out one while allowing one hit and two walks. Erick Aybar (2003) went 2-5 with a RBI, stole a base and scored a run in the Angels 6-4 extra inning loss to the White Sox. Alberto Callaspo (2003) was 2-4 with a RBI, Peter Bourjos (2007) went 1-4 with a triple and scored a run and Howard Kendrick (2004) was 1-4, stole a base and scored a run in the loss. Hank Conger (2007) went 0-4 and Mark Trumbo (2006-07) was 0-3. Tyler Chatwood (2009) worked 6 1/3 innings while allowing one run to take a no-decision. Rich Thompson (2003) retired the only batter he faced for his first hold of the season. Jordan Walden (2008) took his second blown save allowing two runs in the ninth inning. Kevin Jepsen (2003-04) took the loss allowing a pair of runs in the tenth inning. Casey Kotchman (2002) went 2-5 with a RBI in the Rays 8-2 win over the Indians. John Lackey (2000) took the loss allowing nine runs in 6 2/3 innings of work in the Red Sox 9-3 loss to the Blue Jays. Brandon Wood (2004) was 1-4 in the Pirates 2-0 loss to the Dodgers. Hank Conger (2007) went 3-4 with a double in the Angels 5-3 win over the Red Sox in 13 innings. Howard Kendrick (2004) was 2-6 with a double and scored a run, Erick Aybar (2003) went 1-4 with a double, a pair of walks, a sacrifice and stole a base, Peter Bourjos (2007) was 1-5 with a walk and scored a run, Alberto Callaspo (2003) went 0-6, Jeff Mathis (2002) was 0-1 and Alexi Amarista (2008-09) entered the game as a pinch runner. Ervin Santana (2002) pitched four shutout innings without allowing a hit while striking out seven before a rain delay ended his outing. Rich Thompson (2003) struck out two in 1 2/3 inning of work following the delay. Jordan Walden (2008) gave up two runs in the ninth for his first blown save. Trevor Bell (2007-08) struck out three in four innings of scoreless relief to earn the win. Alexi Casilla (2004-05) was 0-4 in the Twins 3-2 win over the White Sox. Casey Kotchman (2002) went 0-2 with a pair of walks, scored a run and stole a base in the Rays 3-2 loss to the Blue Jays. Sean Rodriguez (2004-05) entered the game as a pinch runner. Brandon Wood (2004) was 1-4 with a RBI in the Pirates 7-4 win over the Padres.